The Bones Brigade is a well-regarded group of skateboarders who rode for Powell-Peralta skateboards in the early 1980's. By 1987 a series of skateboard films directed by Stacy Peralta sparked international interest in the Bones Brigade, and Tony Hawk, Rodney Mullen, Steve Caballero, Lance Mountain, Tommy Guerrero, and Mike McGill rose to fame as the most influential members. Decades later, George Powell and Stacy Peralta began working on Bones Brigade: An Autobiography, a documentary film released in 2012 that celebrates the triumphs, and reveals the challenges of key people involved. Take a trip down memory lane and feel the rush of rolling with the skaters who helped pave the way to where skateboarding is today. 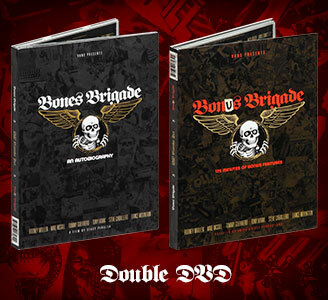 Here you can browse a unique selection of Bones Brigade skateboard products.